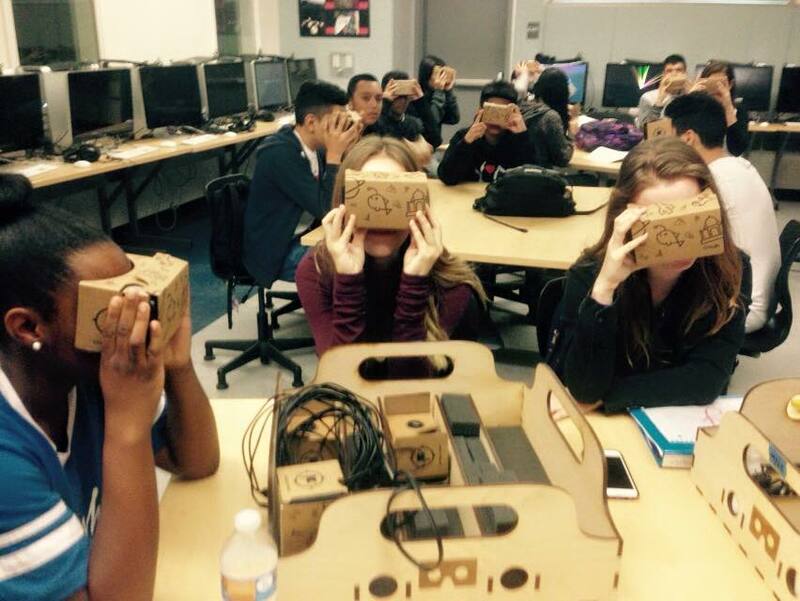 My students going on a Google Expedition in 2015. I’m three weeks into two courses on VR and AR for education and so far I’m a bit disappointed in both. I was similarly disappointed when I signed up, did all the paperwork for, and brought Google Expeditions to my class a two years ago. It was exciting and new, but the kids were done with it in about twenty minutes. There was not much education going on, just “hey, let’s go here let’s go there.” kinds of experiences. I tried to talk about some of the places but it’s kind of like talking to kids who are in front of computer screens or phones, not much gets through. So a few years later and I’m now excited and taking classes in AR and VR in education. I’m still not impressed. Most VR experiences are just looking around. There is something cool about being able to go to a distant place and look around, but there is no education in it other than what you absorb by seeing. You can do that with a picture as well, there is just more directions to look in a VR experience. The worst part is the cheap headsets. The user experience you get from plopping a phone into a headset is cool for about five minutes. Then the bad viewing experience, the disorientation caused by turning your head, and the sick feeling like you’re going to throw up takes over. All this and you are still just looking around at things. There needs to be an effort to bring teachers into the creation of VR experiences so that all “Expeditions” have something the students can take back to the real world. Students need to go somewhere, find information or just be able to screenshot things, and bring it back to the real world where they can create presentations, write papers, or blog about their experience. I’m really excited about AR and VR’s potential to education but I’m not seeing it yet. It’s all whiz-bang spectacle like 80’s 3D where you poke a stick at the camera and everyone acts like they got their money’s worth. My worry is that even with big Hollywood-level VR experiences being created that VR will go the way 3D did. After Avatar there were 3D TVs, goggles, and plenty of movies that came out in 3D. It seems to have died a quiet death though in home viewing. I don’t think anyone enjoys putting on a headset for longer than 15 minutes. I sure don’t want to sit in my house with one on. But maybe some advancements can be made with glasses. This is a good opportunity to bring educators together with artists and programmers to begin creating truly educational VR experiences.